The Bibler Tempest is an ideal shelter for any wilderness traveler or mountaineer, built to outlast howling winds and torrential downpours while its contents a" you! a" stay dry & happy. With plenty of room for two, the Tempest's shape maximizes living space by uniting steep walls with a simple floor design. In fact, it stands nearly 4' tall (1.1m) at the peak. Equipped with two attached vestibules, you'll enjoy a 44sq. ft. floor area! This extra space is NOT at the expense of strength. Four Easton 7075-E9 poles bend naturally into the eaves of the tent and are locked into place with Twistlock Pole Ties, providing a strong, secure framework. Both vestibules are seam-taped and corner pockets are RF welded for maximum water protection. 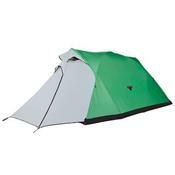 Best of all, every one of these features comes to you at a reasonable price compared to other tents of this caliber.